Wood is timeless. It adds elegance, natural aspect, and nobility to every interior. It warms up even austere places and may be the principal element of a decor. Natural wood used on a bathroom floor, however, poses a challenge. Not many types of wood will function well in very humid or wet conditions (while those that do well are usually very costly). Wood-imitating ceramic tiles wonderfully reflect the appearance of wood, its structure, and coloring. Ceramic wood finds a permanent spot at the place of our everyday beauty routines thanks to its adaptation to the existing conditions. The range of possible arrangement is also very extensive as tiles can imitate almost any type of wood. The use of floor heating systems allows to achieve the natural warm feeling of wood under our feet. Another argument in favor of wood-imitating tiles is their “eco” nature. When choosing such wood for our bathroom, we don’t have to trouble our conscience as no tree will suffer for the sake of our feeling of esthetics. Modern bathroom opening to the bedroom. Harmonious, spacious, and comfortable. Ceramika Paradyż’s Almonte by My Way collection. …it should be enough. Wood perfectly combines with various colors and accessories. Its most beautiful complementation though is probably WHITE. On the walls, as a dominating color in furniture, and bathroom accessories. The white is a perfect companion. It allows the form of wood graining to achieve the fullest effect, show its structure and full palette of colors. 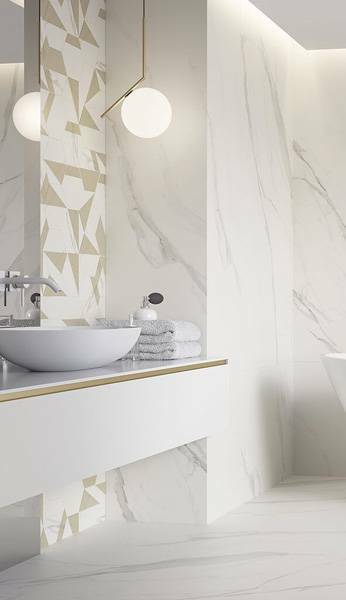 The white adds space to rooms, makes them looks clean, and triggers the feeling of deep tranquility – all the elements a bathroom requires. Ceramic wood creates a perfect ECO atmosphere embedding itself in the natural landscape outside… or creating one even in the heart of a big city. Ceramika Paradyż’s Thorno collection. Long ceramic board Thorno 16 x 98.5 cm. At first glance, it looks no different than natural wood. Boards, staves, or maybe a mosaic? With wooden ceramic we can play as much as we want, laying it in different patterns: block, regular and irregular brick, basket weave, herringbone (classic, French, double, or triple). The number of combinations is really large. For example, bright wood combined with white will give a room some vigor making it appear visually larger. This combination works perfectly in minimalistic interiors. When arranging a bathroom, we should think in a holistic manner – what effect do we wish to achieve? How many elements should draw attention? If we opt for the richness of color of our wooden floor, then the walls should be a neutral, almost “transparent” background. Warm shades of hazelnut wood, from bright to dark, is a mesmerizing view which we will probably never get bored of. Perfect smoothness of white walls, through contrast, additionally brings out the beauty of the wood. Ceramika Paradyż’s Noce by My Way collection. 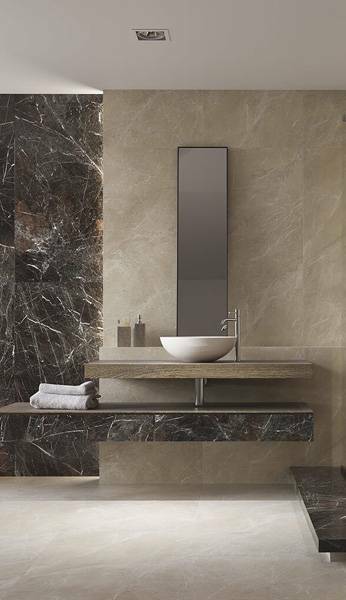 Wood as an additional element on selected vertical surfaces enhances the effect of nobility and natural character. Mosaic from Ceramika Paradyż’s Noce by My Way collection. Maloe Beige, 16 × 65.5 cm. Maloe Natural, 21.5 × 98.5 cm. 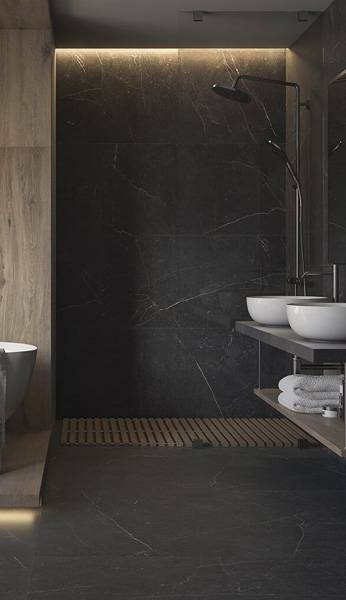 Perfectly aligned edges of the tiles give them elegance and help keep the bathroom clean. Ceramika Paradyż’s Rovere by My Way collection. Clean, clear, transparent. Serenity at dawn and relaxation at dusk. 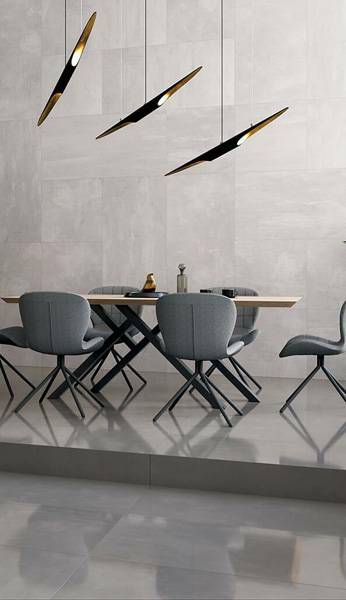 Ceramika Paradyż’s Tqeuila wall tiles collection. The whiteness of the walls doesn’t have to be boring at all. On the contrary, it may become the principal hero of the interior. All we have to do is give it impressive structure and pick tasteful furniture, lighting, and accessories. Then, the entire arrangement may be a very interesting dynamic combination. The structure of the bright walls makes the arrangement dynamic. Something more “is going on” here. The tranquility of the wooden floor laid in a traditional pattern additionally enhances the expressive nature of the entire interior. Ceramika Paradyż’s Pandora tiles collection. To arrange a kitchen in a rustic or vintage style, it’s worth considering using aged HERRERA tiles, in both dark and washed out version. Boards from this collection will also work in bright Scandinavian style arrangements. Herrera Nero 14.8 × 89.8 cm. Herrera Bianco 14.8 × 89.8 cm. Herrera Bianco 19.8 × 119.8 cm. The white color and wood make a wonderful background for experiments with space. It’s a simply perfect choice for all those who feel the need for radical changes in their surroundings more often than others. The neutral nature of the white and wood combination is an invitation to play with accessories and refreshing the arrangement according to the evolving fashion or tastes. We can change the overall expression of the entire arrangement by adding a colorful accent or eye-catching accessory to the white and wooden background. Details that can introduce a significant change are, for example, plants (bonsai tree), flowers in glass vases, candles of various shapes and colors, and any objects of intensive colors (principally bathroom accessories and textiles). The universal white and wooden basis. Ceramika Paradyż’s Modul / Purio, Pago Natural floor collections. Wood doesn’t necessarily have to be on the floor. Using wood on the walls is also a good move in the bathroom. We can break the monotony by using various colors of ceramic wood. Various types of wood may be an interesting idea for the bathroom arrangement. Ceramika Paradyż’s Hasel collection. Contrary to expectations, even here we must be careful when combining particular elements so the entire arrangement remains harmonious and coherent. It’s a good idea to go with one attention-drawing element and build the rest of the arrangement around it. The rich wood form together with diversified color scheme would require for the walls to remain rather modest. And the other way round, when the floor has a serene and uniform look, we can give the walls the “wow” effect! The diversity of formats, designs, colors, textures, and types of wood-imitating tiles encourages creative combinations. You can find lots of other bathroom arrangements on our website: www.paradyz.com.